Wishing everyone a happy Makar Sankranti ….also known as Uttarayan a Hindu Festival celebrated in parts of India and around the world. Til ke ladoo is a traditional winter sweet. This is a super simple recipe made with Til and jaggery. Til is sesame seed and jaggery is unrefined cane sugar. Til ke Ladoos are eaten especially for Makar Sankranti festival in the cold weather climates. 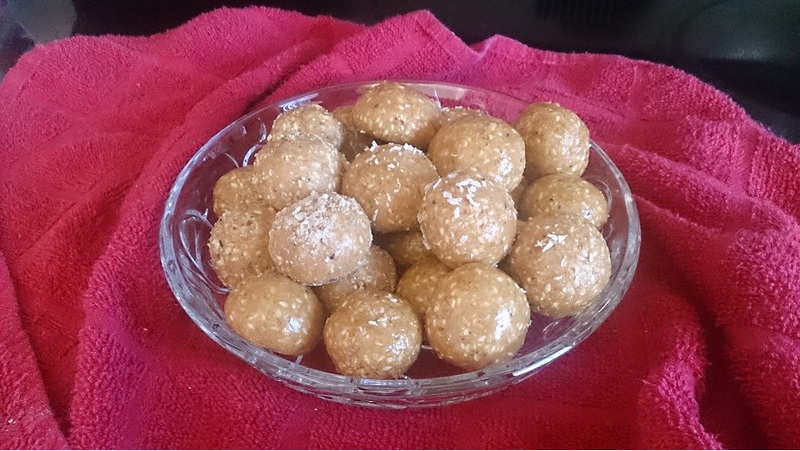 I added a bit of a twist to the ladoos by adding dry fruits …….makes it very tasty. 1/2 teaspoon crushed cardamom or adjust to your taste. In a frying pan dry roast the sesame seeds on medium heat stirring continuously. Sesame seeds will become light golden brown. This should take 4-5 minutes. Take the seeds out in a bowl. Set aside. In the same frying pan dry roast the dry fruits for about 4-5 minutes stirring continuously till slightly brown. Take out in another bowl and set aside. In the same frying pan heat the water and add the jaggery (gur). Simmer over medium heat till it starts caramelizing. To test if ready add a drop of the syrup into a bowl of cold water and if it forms a ball then it is ready. This should take 4-5 minutes. Then reduce the heat to low. Add ghee, cardamom, and roasted sesame seeds and dry fruits and mix it thoroughly with melted jaggery. Transfer it in greased plate let it cool for only about 2-4 minutes so you can start making small to medium size ladoo. Once done making all the Til ke ladoo store in container. This mixture can also be used to make small squares (barfi type) just spread the mixture into square or circle tray ( or use thali) make sure to spread ghee on the bottom pour mixture into it and spread. Cool for about 5 minutes and cut into small square shapes. Dry Fruits can be omitted or altered to any dry fruit you like. Please be sure to send me your feedback on this recipe.